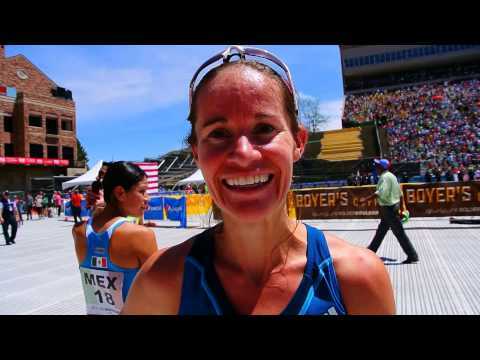 Favorite place to compete: Bolder Boulder 10k: it was the first race I ever ran in high school with my dad. I remember watching the elites in awe after my race, but never in a million years did I dream I would be one of them and get to race in the international elite competition. When my competing days are done, I would like to: I currently work part time at a Physical Therapy clinic. After running, I would love to go back to school and finish my Physical Therapy degree. The PTs where I work do so much for me now, and I am inspired and amazed by their work everyday. I would love to help other athletes someday in the same way that the PTs at Synergy have helped me. From the high plains of Laramie, WY, Mattie attended Laramie High School. From here, Mattie's path to becoming a USA Champion is somewhat different than many elite runners. She says, "I played volleyball for most of my time in high school, until I was cut from the team, so I joined cross country. My times were not very fast coming out of high school, so I walked on to a small school, Eastern Washington University. I slowly improved every year and eventually transferred to my dream school, University of Oregon, where I attended grad school and was a three time All-American." Mattie would earn a degree in Exercise Science from EWU and a Master's in Exercise Physiology from UO. Much of Mattie's success has come on the hills, dirt, and mud that accompany cross country, winning the 2012 National Club XC Championships, and the 2016 USA XC Championships. Off the track and trails, Mattie lives with her husband on 3 acres in Colorado Springs and has a dog, a cat, and lots of chickens that they get fresh eggs from daily. Breaking the tape is not Mattie's only claim to fame, as a restaurant owned by her uncle in Elko, NV called Mattie's Bar n' Grill was named after her when she was six years old, about which, she says, "I spent several summers waiting tables there throughout college and my uncle, mom, and the rest of the crew at Matties are some of my biggest fans."